Our liner will also protect from stains, scratches, chemical spills and much more. The mats are designed to fit many different cabinet manufacturers base cabinets. Our mats can be installed in any base cabinet with or without a center support. 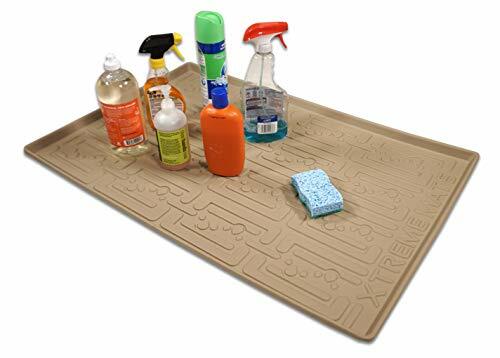 Xtreme Mats Under Sink Kitchen Cabinet Mats are capable of holding 3 gallons of water in the event of a leak or product spill. Our liner will also protect from stains, scratches, chemical spills and much more. The mats are designed to fit many different cabinet manufacturers. We have designed channels in the mat that will direct any liquid to a water sensor (sold separately) that will siren when liquid comes into contact with the sensor. WARNING BEFORE ORDERING: MEASURE THE INSIDE OF YOUR CABINET AND MAKE SURE YOUR SUPPLY LINES AND DRAIN AREN'T COMING FROM THE FLOOR OF YOUR CABINET. Warranty Limited lifetime warranty against manufacturing defects.